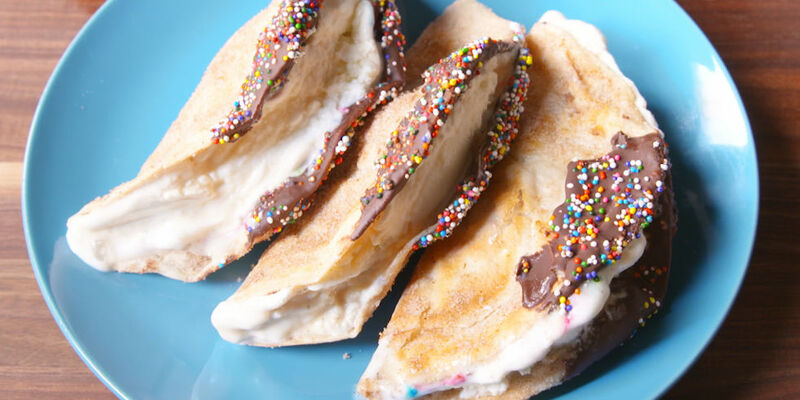 This recipe for Ice Cream Tacos is perfect now that it is getting hotter! Combine the Cinnamon and Sugar on a Small Plate. Melt the Chocolate Chips until Smooth. Heat the Butter in a Small Skillet. Heat the Tortillas 1 at a Time for Approximately 2 Minutes per Side. Cover Both Sides with the Cinnamon and Sugar. Fold the Tortillas in Half, and Dip the Edges into the Chocolate then the Sprinkles. Place the Tortillas in an Upside Down Muffin Pan to let the Chocolate Set. Fill Each Taco with Vanilla Ice Cream and Top with Caramel Sauce. Place in the Freezer until Hard.